When starting a business, you can often get caught up in trying to make things perfect vs just getting things done. The best things you can tell yourself in this situation are (1) that nothings perfect, (2) that failures will happen and (3) that failures are an amazing learning experience. From there all you can do is move forward. On area that can trip an entrepreneur is getting the branding "just right". The one thing that's amazing about branding is that the consistency in everything from colors and fonts to customer service and marketing experiences is what makes a brand. Your personal color preferences are rarely an important factor. The beauty of this realization is that once you accept that nothing is perfect and that consistency is the key to branding, you can move quickly and intentionally in turning your idea into a brand. So let's get started. Here are 3 tips to turning an inspirational photo into a color palette for your brand so that you can start using them consistently across your marketing materials, packaging, and more. 1. Find a photo that represents your brand. Before choosing any photo to represent your brand, I strongly recommend that you complete a brand strategy exercise. This will help you determine what your company stands for, who you are looking to serve, and what the personality of your brand is. Once you've identified the words that define your brand, you can begin to explore and identify the photo that best represents your brand. 2. Identify a color from that photo that best communicates your company's energy. Photos are filled with shades and variations of all the colors depicted. Wither it's a prominent color in the photo or a small glimpse of a color in the background, hold onto to that color and identify a Hex code or RGB that best represents that color. When I'm looking for a color, I upload the photo to a site like HTML color codes to quickly grab the color code that I'm looking for from the photo (or a color close to it). Looking for some inspiration? 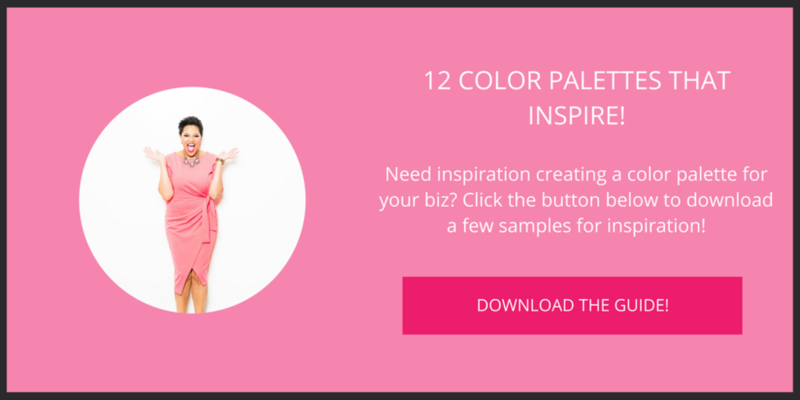 Click here to download 12 color palettes that inspire. 3. Use a color palette generator like Color by Adobe. If you're not a graphic designer by trade or naturally gifted in design, I can't recommend Color by Adobe enough. It's a great tool to generate a color palette (or a few) from one color. Simply copy and paste the RGB or HEX code for the color you've chosen to represent your brand and then toggle between different color rules to find a color palette that resonates. Want to customize your own? That's an option as well. Just remember, a brand is born out of the consistent action of fulfilling the promises you've made to your customers as well as the consistent use of visual elements. While visual elements play an important role in your overall brand, it's most important that you are consistent in the elements you've chosen than not 100% loving that shade of blue. I ALSO HAVE A PRIVATE FACEBOOK GROUP WHERE I’D LOVE TO CHAT WITH YOU AND ANSWER YOUR QS! CLICK HERE TO JOIN. Have questions? Comments? I’d love to hear from you! Let’s chat down below.